Communications is the branch of language arts, which focuses on the comprehensive expression of sound and visual, oral, and written symbols. Study in communications is geared toward understanding the many ways human beings develop, collect, disseminate, and transfer information through symbols, particularly via the mass media. Major areas of specialization include journalism, telecommunications, film, TV, radio, and advertising. 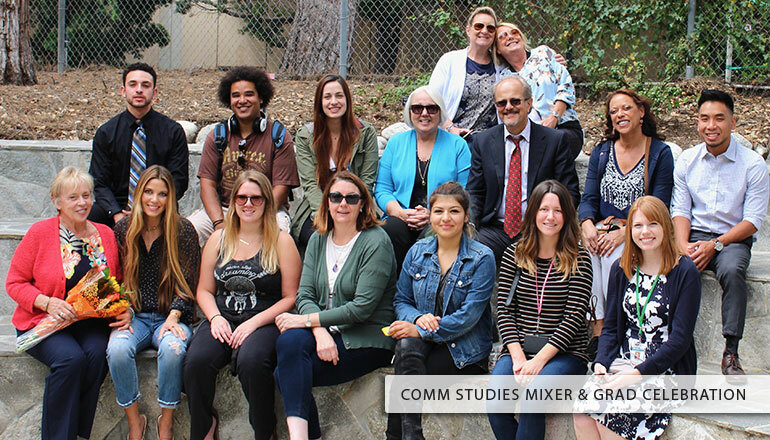 The Communication Studies Transfer major focuses on how people construct, use, and interpret messages across multiple channels to inform, persuade, manage, relate, and generally influence each other within and across varying cultural venues. Emphasis is also placed on identifying and valuing disparate systems of social norms and values that influence the human communicative process. Students will learn and understand the various theoretical and pragmatic skills that enable them to navigate social interaction within multiple interpersonal, small group, public, and intercultural contexts. Students will thus become familiar with both field-specific nomenclature as well as effective oral, listening, and critical thinking skills needed to effectively manage communication encounters in diverse social environments. Students will be prepared for a baccalaureate degree in Communication Studies, Speech Communications, or a similar degree. Construct, use, and interpret messages across multiple channels to inform, persuade, manage, relate, and generally influence each other within and across varying cultural venues. Identify and value disparate systems of social norms and values that influence the human communicative process. Understand the various theoretical and pragmatic skills that enable them to navigate social interaction within multiple interpersonal, small group, public, and intercultural contexts. Become familiar with both field-specific nomenclature as well as effective oral, listening, and critical thinking skills need to manage effective communication encounters in a diverse society. This course is a survey of the process, analysis and theory of one-to-one oral communication. Content areas include self-concept, perception, cultural influences, listening, verbal messages, nonverbal messages, conversation, relational development and conflict management. Students will learn theories that explain human communication behavior and in addition will be required to practice effective interpersonal communication skills in various contexts. C-ID COMM 130 Lecture. Optional pass/no pass grade. Transferable to CSU; UC. This course focuses on understanding and applying the fundamental principles of public speaking. These speech skills include identifying the purpose, selecting the topic, conducting research, organizing content and outlining the speech, choosing appropriate language, using effective visual aids, adapting to the audience and occasion, and delivering the speech in a manner that is both verbally and nonverbally effective, while also learning to evaluate the speeches of others. Students will learn to present information clearly, reasonably, and persuasively by giving individual speeches and participating in group presentations. Recommended for Speech Communication, Business and Education majors. UC Credit Limitations: COMM G110 and G110H combined—maximum credit, one course. C-ID COMM 110 Lecture. Optional pass/no pass grade. Transferable to CSU; UC. This course is recommended for Communication Studies, Business, Education majors & individuals interested in participating effectively in groups in work or community settings. C-ID COMM 140 Lecture. Optional pass/no pass grade. Transferable to CSU; UC. This is a course presenting the principles of argumentation: reasoning, critical thinking, and the analytical skills necessary to construct arguments and refutations. Recommended for Communication Studies, Business and Education majors. C-ID COMM 120 Lecture. Optional pass/no pass grade. Transferable to CSU; UC. May not be offered each semester. This course presents theories and skills to address and settle conflict situations by utilizing the negotiation and mediation processes. The student will learn how to assess conflict situations and determine the appropriateness of negotiation and mediation. Students will learn theories and skills through lecture, role playing, dialogue and in-class simulations. Students will also examine different contexts for negotiation and mediation including family, school, community and business situations. Videos and student presentations of negotiation and conflict resolution topics complement the lectures, simulations and role playing. Lecture. Optional pass/no pass grade. Transferable to CSU. This course analyzes the study of communication from an intergroup, culture-general perspective. General theories of communication (e.g., uncertainty/anxiety reduction, relationship development, nonverbal expectancy violations, ingroup-outgroup stereotyping) are integrated with theories of cultural difference (e.g. individualism-collectivism, cultural variability, low-high context communication, cultural value orientations, dimensions of culture, Confucian cultural patterns) to explain, predict and improve communication behavior. Communication is examined in both cross-cultural and intercultural settings, with the goal of increasing intercultural effectiveness and minimizing prejudice and discrimination. C-ID COMM 150 Lecture. Optional pass/no pass grade. Transferable to CSU; UC. This course focuses on understanding and applying the fundamental principles of communication in organizations. These elements include organizational communication models, the role of ethics and diversity, basic communication skills, interviewing skills, communicating in groups and teams, conflict management, leadership, and presentation skills. Students will learn to analyze, adapt, and improve their communication strategies in organizational settings by applying and practicing the knowledge and skills acquired in this course. Recommended for Communication Studies, Business and Education majors. Lecture. Optional pass/no pass grade. Transferable to CSU. This course explores the role, influence, effects, and significance of gender on our everyday communication interactions. Students will use theoretical perspectives to critically examine gender phenomena, gender socialization, and stereotypes to enable students to appreciate gender differences and interact more effectively. Lecture. Optional pass/no pass grade. Transferable to CSU; UC. Kristine Clancy is a full time instructor in the Communication Studies Department. She has been teaching college-level communication courses for more than a decade. Before coming to Golden West she taught at Purdue University, Pepperdine University, and a number of local community colleges including Long Beach City College and Cypress College. Her interests include Public Speaking, Intercultural, Interpersonal, and Gender Communication. In addition to teaching, Kristine is also active in the Open Educational Resources (OER) movement, editing an OER Interpersonal textbook and advocating for the use of free course materials in all of our communication courses. She has a passion for students and is actively involved in the equity movement at Golden West College to foster a more inclusive and welcoming environment for all students. When she is not on campus Kristine enjoys baking, blogging, and spending time with her family. B.S., Regis College, Denver; M.A., Arizona State University. Rachel A. Wegter has taught at Goldenwest College for nearly a decade and is excited to be one of the Communication Studies Department’s full time instructors. Her major areas of focus include public speaking, mediation and negotiation, organizational communication and social media; she is working to foster local internship opportunities for GWC COMM majors and is also active on the GWC IPD Committee. An alumnus of CSULB, Rachel taught communication courses at CSULB, L. A. Valley College and Coastline College, developed distance learning classes for military personnel and ran speech and journalism programs at a large urban high school in Long Beach for many years. She is a published author of a public speaking textbook and currently enjoys regularly contributing to a variety of digital outlets. She has a passion for teaching communication due to its unmitigated relevance; everything learned in a communication course can be applied in daily life! In her spare time, she loves antiques, silent cinema, writing, photography, traveling and spending time with her family and pup, Jethro. Katie Barone-LaBreau has taught at Goldenwest College for almost 3 years now as an adjunct faculty member. However, she has been teaching for about 6 years at various schools in Southern California, including: Santa Ana College, Cerritos College, and Long Beach City College. Katie’s major areas of focus include public speaking, interpersonal communication, and small group communication. As a community college alumnus of Cerritos College, Katie received her Associates Degree and then transferred to CSULB where she later received both her Bachelor’s and Master’s degree in Communication Studies. Katie has a passion for teaching the art of communication because she loves how applicable the subject is to our every day lives. She enjoys helping her students realize the significance of practicing their communication skills by engaging them in a lot of skill based training activities. In her spare time, she loves to travel with her husband, go running at the beach, and spend time with her family. Katie Bruns began teaching at Golden West in Fall 2015 after graduating with a M.A. in Communication Studies at California State University, Long Beach. With a B.S. in Business Administration from Chapman University, Katie also has experience in management, marketing, and event planning. In addition to teaching at a variety of local colleges, Katie loves running, making lists, advocating for social justice, and adventuring with her husband and two kids. Katie thrills in helping students give voice to their passions in her Public Speaking classes and teaching students how to build successful and satisfying relationships in her Interpersonal Communication courses. Her utmost goal as an educator is to help students pursue their passions. She agrees with Howard Thurman when he said, “Don’t ask yourself what the world needs. Ask yourself what makes you come alive, and go do that, because what the world needs is people who have come alive.” Katie’s goal in teaching is to help others come alive. Anthony Cuomo began teaching part-time at Goldenwest College in Spring, 2014, shortly after graduating with a M.A. in Communication Studies at California State University, Long Beach. He teaches public speaking and interpersonal communication and also helps facilitate student learning outcome assessments in the department, which help evaluate what skills students’ gain from their public speaking coursework. Anthony also teaches lower and upper division courses at El Camino College, CSULB, and serves at the Director for Community Outreach & Development for the Center for First Amendment Studies. Besides teaching, he stays active in the Communication discipline by presenting at regional and national conferences annually. In addition to teaching and mentoring, Anthony enjoys traveling, learning, advocating for social justice, and living a healthy active lifestyle. Kayla R. Graney has nearly six years experience teaching communication courses and has taught at Goldenwest College for three and a half of those years. Her major areas of focus include public speaking, organizational communication, small group dynamics, and interpersonal communication. An alumni of CSUF, Kayla taught communication courses at CSUF, Saddleback College, Irvine Valley College, Mt. San Antonio College and was a speech and debate coach for both CSUF and Irvine Valley College. In addition to teaching, she has years of experience in the communications field working as a traffic reporter, marketing specialist, and executive director. Along with teaching, Kayla is also an executive coach who has dedicated herself to helping leaders and their teams create meaning in their own lives and in their organizations. She is drawn to teaching because she truly believes the skills that are being taught have practical applications beyond the classroom and her goal is to set her students up for a successful career in the workforce. She not only sees herself as their instructor, but as a mentor and coach in life. In her spare time, she loves spending time with her family, taking weekend adventures, and shooting photography. Heather Kelley, Orange County native, has been teaching at Golden West College since 2014. She began her college career at Orange Coast College. This is where she discovered her passion for the discipline. She then transferred onto California State University, Fullerton, to earn her B.A. and M.A. degrees in Communication Studies. She now currently works at Golden West College and Cerritos College teaching Communication Studies courses. In her spare time, she enjoys walking along the beach, practicing yoga, traveling, and spending time with family and friends..
Debby McPherson has taught communication courses for 22 years (at GWC for 11 years), with her major areas of concentration being Argumentation Essentials, Public Speaking, Interpersonal Communication and Organizational Communication. In addition to her course instruction, she was a Debate Coach for a local high school for 5 years. In her spare time, she loves watching her son play soccer and traveling. David Rehm is excited to be part of the Golden West College staff. As a former student of the community college system, he appreciates the opportunity to come back to the environment that inspired his path to teaching. His areas of focus and interest include oral interpretation, public speaking, culture and gender, and interpersonal communication. As a former CSULB 49er, David has taught courses at CSULB, Cerritos College and Santiago Canyon College. He has been fortunate to have had the chance to assist in the development and updating of performance classes such as readers theater, and oral interpretation. David is a past member of CUSLB’s InterACT Performance Troupe where he had the great honor of performing for the US Military and numerous universities throughout the nation on social justice issues such as sexual assault awareness/prevention and inappropriate purist. He truly does believe that communication can indeed change the world. When he is not in the classroom or spending time with his family and friends you can probably find him in the water at the beach, at the gym, or hiking with his dog, Jinx. Michelle Roché has been a communications adjunct faculty member since 1996 at Mt. San Antonio College and started teaching at Golden West College (GWC) in 2002. She is a proud graduate of the California Community College system and has a love for learning. Being a part of the Golden West College family has been an honor for Michelle. She has been able to be a business partner to the Associated Students (AS) and had the privilege of working with AS with their retreats and various leadership programs. Michelle has a Bachelor of Science in Specialized Communications from Cal Poly Pomona, and a Master of Arts in Speech Communication from Eastern New Mexico University. Tiffany A. Ruggeri is a part time instructor at Goldenwest College. Professor Ruggeri is an alumnus of California State University, Fullerton, and background is primarily in the areas of argumentation and persuasion, interpersonal, and instructional communication. Professor Ruggeri believes in student-centered learning, and that coursework should be designed so that what is learned in the classroom will aid in student success in all facets of life, in real time. Professor Terrence A. Snodgrass has been with Golden West College since 2008 teaching Public Speaking and Interpersonal Communication. Terrence has earned a Bachelor’s Degree in Communication Studies at California State University, San Bernardino and a Master’s Degree in Communication Studies at San Diego State University. In addition to teaching at GWC, he has also taught courses at Orange Coast College, Chapman University, and Fullerton College. Outside of teaching he Terrence served as wedding officiant for over 100 weddings, and has worked as a public speaking consultant, personal trainer, and in sales. Terrence lives in south Orange County with his wife and three daughters. Emily Vu has been an adjunct faculty at Goldenwest College for almost two years now, though she has been teaching Communication Studies courses for over ten years. She started out at Santiago Canyon College and moved to Highline College in Washington State for a tenure-track position but found out that there’s no place like California. Currently, she is an adjunct faculty at GoldenWest and Fullerton College teaching in areas of Interpersonal, Intercultural, and Public Speaking courses. Emily is also working on a doctorate in Community College Leadership at Oregon State University. Her areas of interests are equity, critical race theories, and remediation education – and the lasting impact it has on higher education. Emily volunteers her time at the Maple Center after-school program in the city of Fullerton, teaching elementary children on topics like self-advocacy, community building, anti-bully with her colleagues. Her group present a workshop at the Western State Communication Association about the after-school program learning collaboration efforts. In her spare time, she loves to hang out with her four-year daughter and traveling. Summer Wagner received a M.A. in Communication Studies in 2009 from California State University, Long Beach. Since then she has taught students in high school (Inglewood City Honors and Compton Early College) and college (El Camino College – Compton, Cerritos, Santa Ana, CSULB). Her course offerings center around lower division communication courses; including Public Speaking, Interpersonal Communication, Small Group Discussion, and Argumentation and Debate. Her passion for teaching stems from her own communication apprehension, which is the way she relates to the anxious student. She has attended faculty trainings and is constantly looking for ways to keep students engaged. In her free time, she enjoys spending quality time with her family, practicing yoga, and exploring new places.